There are plenty of options to share your findings – locally, regionally and nationally. Participating in ground-breaking research is just one part of the equation. Sharing what you've learned is the other. And at Concordia, you'll have no shortage of opportunities to do just that. We encourage students to present their research. With opportunities both on-campus and across the country, you'll be able to present your research to peers, professionals and experts in your field. The Celebration of Student Scholarship (COSS) is a full-day symposium showcasing research, scholarship, and creative activity in all disciplines carried out by undergraduate students at Concordia College. 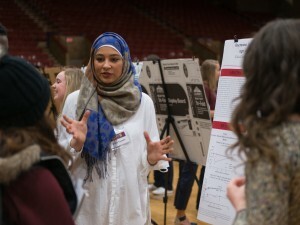 Hosted at Concordia's Memorial Auditorium, COSS features paper presentations, artist talks, poster sessions, art exhibitions, department and program sessions, career preparation resources, and excellence awards for both students and faculty mentors. The National Conference on Undergraduate Research (NCUR) is dedicated to promoting undergraduate research, scholarship, and creative activity in all fields of study by sponsoring an annual conference for students. This gathering of developing scholars welcomes presenters from all institutions of higher learning and from all areas of academic study. 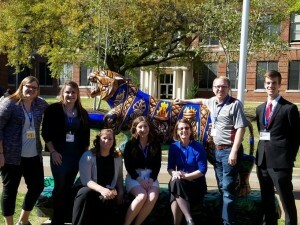 Through this annual interdisciplinary conference, NCUR creates a unique environment for the dissemination, celebration, and promotion of undergraduate student achievement; provides models of exemplary research and scholarship; and helps to improve the state of undergraduate education. The Drache Lecture Series welcomes applications from juniors and seniors of all majors at Tri-College institutions to present their work at the Comstock House and Historic Site in Moorhead. Those chosen as distinguished Drache speakers will receive a $50 honorarium and certificate.